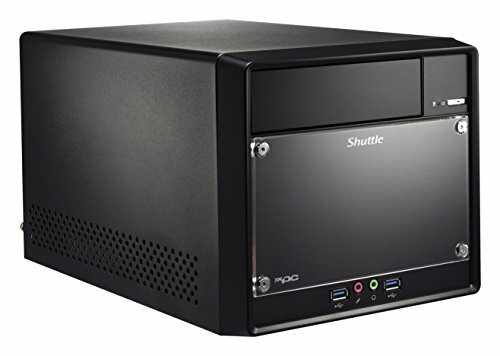 SHUTTLE SH110R4 LGA1151/ Intel H110/ DDR4/ SATA3&USB3.0/ A&GbE/ 300W Mini PC Barebones system. Processor: LGA1151: supports Intel Skylake Core i3/i5/i7 processors; support up to 95W tdp. Chip set: Intel Skylake H110 Express. Memory: 2x DDR4-2133 DIMMs, dual channel, max capacity up to 32GB. Slots: 1x PCI-Express x16 slot, 1x PCI-Express x1 slot, 1x M.2 max to 2280 type M key socket, 1x M.2 max to 2230 type a, E key socket. Sata: 3x SATA3 ports. Audio: Realtek ALC662 5.Channel high Definition audio codec. Video: integrated Intel HD 530 graphics in CPU. Lan: Intel i219lm gigabit Ethernet controller. Drive bays: 1x 5.25" ODD bay, 2x 3.5" HDD bays. Ports: 4x USB 3.0 ports (2 rear, 2 front), 4x USB 2.0 ports, 1x PS/2 port, 1x VGA port, 1x HDMI port, 1x DisplayPort, 1x RJ45 LAN port, 1x microphone-in, 1x headphone-out, audio I/O jacks. Power supply: 300W 80 plus bronze power supply; input: 100240V AC.Form factor: SHUTTLE form factor. Operating system: supports Windows 10/ 8.1/ 7 & Linux. If you have any questions about this product by Shuttle, contact us by completing and submitting the form below. If you are looking for a specif part number, please include it with your message.